Measured by both population and area, Brazil is the fifth largest country on the planet. The soccer-crazy country covers more than 8.500 million km2, while the estimated population is approximately 211 million. The ‘República Federativa do Brasil’ shares borders with multiple countries, including Suriname, Bolivia, Paraguay, Colombia, Uruguay, Guyana, Argentina, Perú, French Guiana, and Venezuela. In addition to the official languages, Portuguese and Brazilian sign language, there are nearly 180 other languages. English, German, Italian, alongside multiple indigenous languages, are the most spoken minority languages in Brazil. Christianity is the dominant religion, while there are various minority religions, ranging from Buddhism, and Judaism to several indigenous religions. 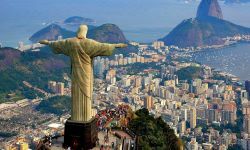 Brazil is famous for its beautiful beaches, carnival, samba, gorgeous women, and the impressive Christ the Redeemer statue in Rio de Janeiro. The beach at Ipanema and Copacabana Beach are without a doubt some of the world’s most iconic beaches. Caipirinha is undoubtedly the country’s most popular cocktail, while feijoada, a stew of beans with beef and pork, is Brazil’s most famous dish. Brazil has produced a huge number of talented soccer players, such as Neymar, Ronaldo, Romário, Ronaldinho, Rivaldo, and of course Pelé. Formula 1 driver Ayrton Senna (1960 – 1994), supermodel Gisele Bündchen, actress Paola Oliveira, film director Fernando Meirelles, and architect Oscar Niemeyer (1907 – 2012), are some other famous Brazilians. All forms of gambling are banned in Brazil, with the exception of lottery games, betting on horse races, video gaming machines, and bingo. There are no national online casinos or sportsbooks, but Brazilian gambling fans can freely enjoy games of luck at sites hosted in countries. Players of foreign online casinos face no penalties and the Brazilian government doesn’t restrict access to any such platform to date. Brazilians have a great love affair with games of chance, while sports betting is another big favorite despite the gambling ban. Fortunately, most foreign operators accept players from Brazil, while some of them offer the Portuguese language, and game-play in Brazilian reais. Based on nominal gross domestic product (GDP), Brazil’s economy is the ninth largest in the world, and the largest one in the region. With an average expansion of more than 5 percent, Brazil was one of the leading countries in terms of economic growth between 2000 and 2012. The Brazilian economy returned to growth in 2013 (+ 7.5 percent) after a 0.1 percent contraction in the previous year. In 2014, that rate weakened to 4 percent, followed by a 3.8 percent slump in 2015. According to the Instituto Brasileiro de Geografia e Estatística, the economy contracted by 3 percent in 2016. This year’s economic expansion is projected at a modest 0.2 percent. Millions of Brazilians managed to escape extreme poverty thanks to strong economic growth between 2003 and 2014. Indeed, approximately 50 million people joined the middle class, according to the Organization for Economic Cooperation and Development (OECD). However, poverty remains a big problem as nearly 20 percent of the population lives on less than the international standard of $2 per day. A vast majority of all poor people in Brazil reside in the Northeast. Between 2003 and 2014, the poorest Brazilians enjoyed a 40 percent income growth, but a deep recession threw a spanner in the works. A mix of declining commodity prices and political turmoil was the main reason for the economic downturn. In addition to poverty, the government of Brazil has also made significant progress with regard to reducing deforestation. Furthermore, the Brazilian GDP per capita PPP averaged $12,282 between 1990 and 2015. Just like in many countries on the world, an increasing number of Brazilian consumers buy products and services on the world wide web, reaching a total value of $12.8 billion in 2015. Nearly 140 million Brazilians have internet access, which represents a penetration rate of nearly 67 percent, compared to 31 percent in 2007. Almost needless to say that the usage of smartphones and tablets is also on the rise. If you consider the multi-ethnic population, it’s not much of a surprise that many different kinds of gambling are popular in Brazil. The wealth increase combined with the improved internet infrastructure explains the ever-growing popularity of online gambling in Brazil. How to deposit money in an online casino when I’m from Brazil? Fancy to enjoy a staggering session of internet gambling after reading our “online casino Brazil” page? Receive a massive welcome bonus after your first deposit at Royal Panda’s entertaining online gambling site!